West Valley City mayor hopes issues will overcome fallout from Burwash incident. Francisco Kjolseth | The Salt Lake Tribune West Valley City Mayor Mike Winder talks about his plans for candidacy in a run for Salt Lake County mayor. 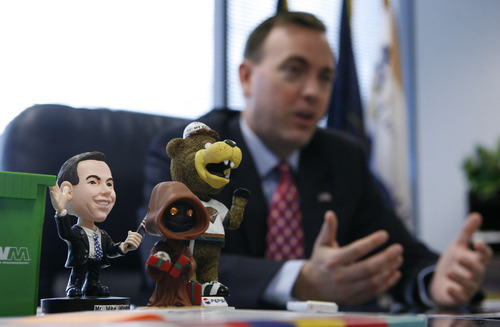 Francisco Kjolseth | The Salt Lake Tribune With a bobble head of himself on his desk, West Valley City Mayor Mike Winder talks about his plans for candidacy in a run for Salt Lake County mayor during interview May 23, 2012. Francisco Kjolseth | The Salt Lake Tribune West Valley City mayor Mike Winder poses for a portrait recently as he talks about his plans for candidacy in a run for Salt Lake County mayor on Wednesday, May 23, 2012. 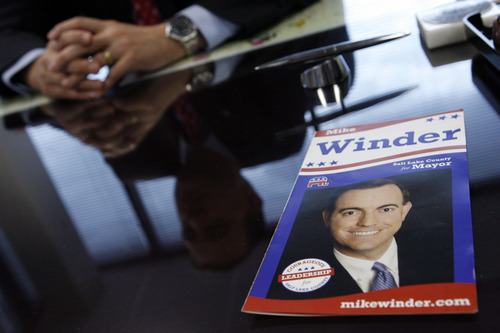 In his quest to be the Republican candidate for Salt Lake County mayor, Mike Winder is counting on his good family name to overcome his nom de plume. That and his political track record of promoting limited government, local control and economic growth. "I'm really proud of our economic growth in West Valley City," said the 36-year-old mayor of Utah's second largest city, pointing to the city's ambitious plans for a new downtown district called Fairbourne Station, the renovation of Valley Fair Mall and the addition of 3,000 new jobs over the past three years. "It's always better to grow a tax base than to raise taxes," Winder added. "That's something I'd like to do at the county level as well." But to succeed Democrat Peter Corroon as Salt Lake County mayor, Winder also will have to get past fallout from revelations in November that he had written 13 articles about West Valley City for the Deseret News, KSL.com and the weekly Oquirrh Times under the pen name Richard Burwash. A photo credited to "R. Burwash" was published in The Salt Lake Tribune. The picture was provided to the paper by Winder ­ who said it should be attributed to Burwash. For the ethical lapses, Winder received a reprimand from the West Valley City Council (he voted for it himself), resigned from his public relations position with The Summit Group, withstood criticism from county Republican leaders and was sued (along with others) for allegedly defaming a former executive of the UTOPIA fiber-optic network in one of those articles. That case is pending in U.S. District Court for Utah. The fact he made it out of the April 14 Salt Lake County Republican Convention from a field of six candidates is evidence to Winder that party delegates have put the Burwash incident behind them. He expects public acceptance of his apologies to be reflected June 26 in a primary election triumph over Mark Crockett, a businessman and former County Council member who also survived the convention fight. Winder feels recognition of his family's contributions to the valley's west side for six generations has helped him retain public support. "I stand on the shoulders of giants," he said, adding "people who know me know my passion and enthusiasm for our community, for West Valley City, for Salt Lake County. That enthusiasm got me into trouble with my pen-name incident. I've learned from that." Winder said he learned "that when you make a mistake, it's better to come forward on your own, which I did. It's always humbling when you make a mistake, but humility helps us better empathize with others and humility helps us to be a better servant. … I apologized about it. I learned from my mistake and we're moving forward." That apology was enough for Taylorsville Mayor Russ Wall, one of Winder's many supporters among local and state government officials. "Any time you get negative publicity, it's not good," said Wall. "But you have to look at the intent. Was he looking to profit from [writing the articles]? Obviously not. He was looking to help his city look better, and he did it in a way he thought would be well received. When he found out it was not appropriate, he apologized and moved on. "Did it hurt him? Yes. But who's perfect?" Wall added. "It's only a big concern to people who want to use it as a political tool." Wall said voters should focus on Winder's performance with West Valley City  as business development director (2000-04), councilman for four years and mayor since 2009, when he was elected with 76 percent of the vote. "I support Mike because he's energetic, he's intelligent and he's a team builder," Wall said. "He's made a difference in West Valley City, and I think he'll make a difference in Salt Lake County." Added Corey Rushton, a West Valley City councilman: "Mike has shown vast amounts of leadership in those visible roles. He's been out telling our city's story better than anyone. He has the demeanor and personality suited to it. When people have one-on-one conversations with him, they leave feeling better about themselves, the community and the world." That ability to connect and work with others is why Winder believes he has secured so many endorsements. Former Govs. Norm Bangerter and Jon Huntsman joined the ranks last week, with Huntsman saying "Mike can lay claim to that which most in politics lack, a real track record of leadership and accomplishments." In all, Winder is backed by seven Salt Lake Valley mayors, nine legislators, 21 city council members, former U.S. Sen. Jake Garn and County Council Chairman David Wilde. 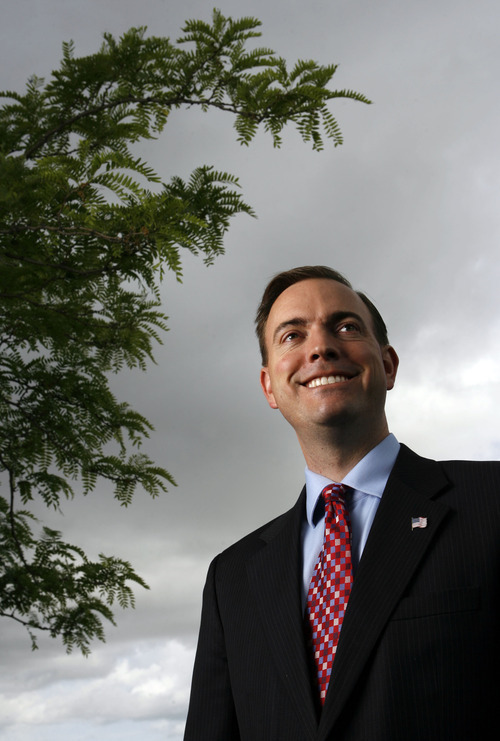 The message he is sending in his campaign revolves around his belief in limited government, his eagerness to foster better working relations between Salt Lake County and the valley's cities and the need to do more to stimulate the county's economic growth. His opponent, Crockett, also espouses limited government and additional measures to get Salt Lake County out of providing municipal services. Where they differ markedly is in their approach to economic development. While Crockett does not believe in government intervention, Winder said his experience in West Valley City's business development taught him "how to make the city more business friendly, how [Redevelopment Agencies] work, how economic development projects can come about." A look around the city, he said, reveals the new TRAX line that will serve Fairbourne Station, an expanding Valley Fair Mall soon to add a Larry H. Miller Megaplex of movie screens, construction of an eight-story Embassy Suites hotel financed through the city Redevelopment Agency, the growth of Lake Park Corporate Center on the city's northern border and Winder Farms' transition from "Utah's oldest milkman into the nation's fastest growing online grocer." West Valley City Mayor Mike Winder will square off June 26 against former County Councilman Mark Crockett to become the Republican candidate for Salt Lake County mayor. The winner will face Democrat Ben McAdams in November.